Amope Pedi Perfect gives you natural looking shiny nails, effortlessly. Great for finger and toe nails. 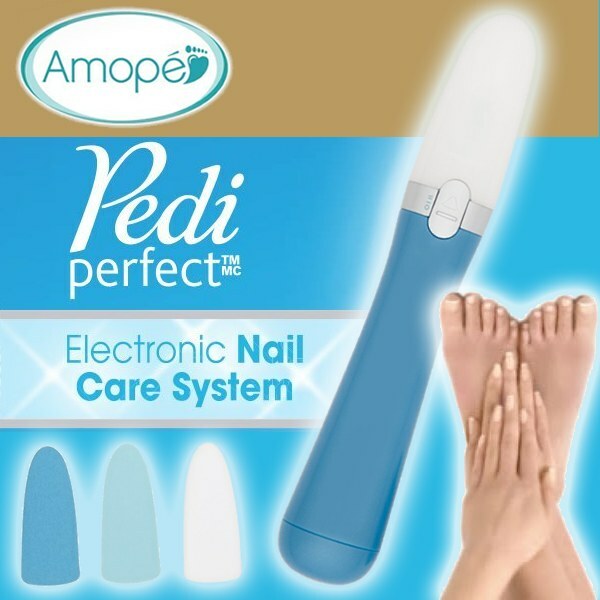 The Amope Pedi Perfect Electronic Nail Care System is the perfect and effortless way to help keep your toe and finger nails natural looking and shiny. This nail file, as seen on TV, has a simple 3 step system that files nails to allow filling and shaping to prevent damage, buffs the nails to even out ridges and smooth the nail surface, and shines nails to promote a natural look. Complement your foot care routine with our specially designed Pedi Perfect foot care range. Includes 1 Pedi Perfect unit, 3 refills, and 1 AA battery.